Shane Victorino's grand slam put the Red Sox into the World Series and made him Saturday's Box-Toppers Player of the Day. Victorino's seventh-inning slam led the Boston Red Sox to a 5-2 win over the Detroit Tigers in Game 6 of the American League Championship Series. The Red Sox win the best-of-seven series four games to two and will face the National League Champion St. Louis Cardinals in the World Series beginning Wednesday in Boston. Victorino had 4.5 Box-Toppers points during the regular season, ranking 224th among all players. As in Game 2 of the series, Tigers pitcher Max Scherzer seemed on track to be Player of the Game when a Tigers reliever allowed a grand slam. In Game 2 on Sunday, David Ortiz hit a game-tying grand slam. And in Game 6, Victorino hit a go-ahead slam after Scherzer was pulled. Before Scherzer was pulled in the seventh inning, he struck out eight. The Tigers, now eliminated, were Box-Toppers top-ranked team at the end of the season, with 123.4 Box-Toppers points. The Red Sox were the fourth-ranked team with 121.7 Box-Toppers points. They now face the third-ranked team, the Cardinals, in the World Series. The Cardinals had 122.4 points. There are no games Sunday, Monday or Tuesday. Coming soon: Box-Toppers previews the World Series between the Cardinals and the Red Sox. 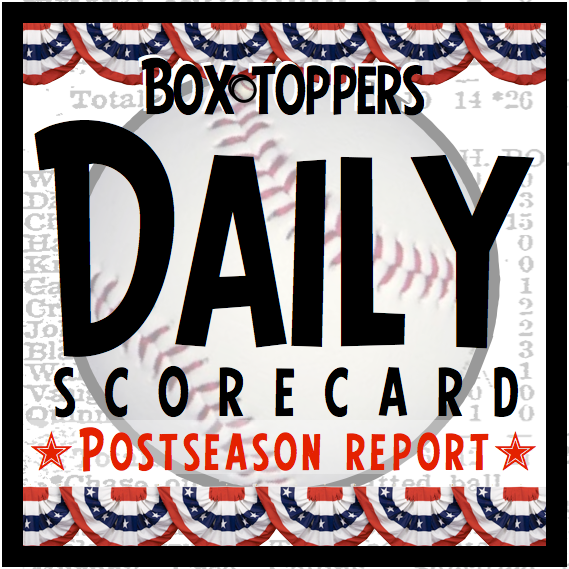 In regular season games, 2.0 Box-Toppers points are awarded for Player of the Day, 1.7 for top player in the opposite league, 1.5 for top batter in each league and 1.0 for the top player in each of the other games. However, no Box-Toppers points are awarded during the postseason. Here are the top six Red Sox players in Saturday's American League Championship Series Game 6, ranked from highest to lowest Box-Toppers game score (how game score is calculated). Shane Victorino, who had a Box-Toppers game score of 3.0 was Player of the Game (POG).